We no longer recommend buying a Boost or Sprint prepaid phone unless you do so in a store where you can run the MEID on the box through Ting’s MEID checker before purchase. 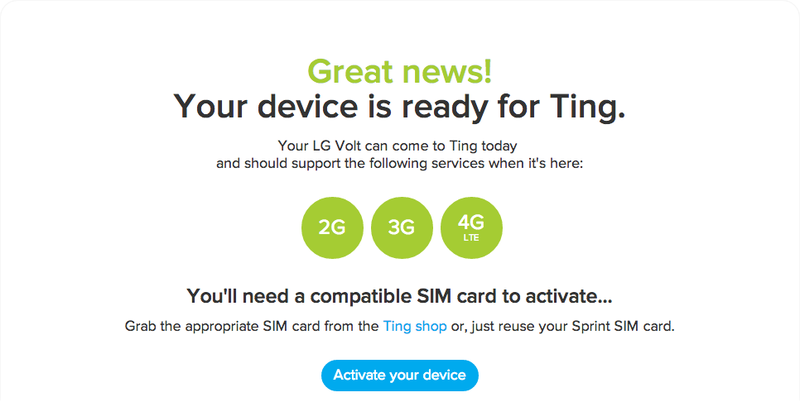 Sprint will not allow used prepaid phones (like the LG Volt) to be activated on Ting unless they have been active for over 12 months on the original provider (i.e. Boost or Sprint prepaid). 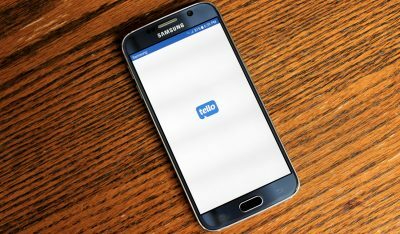 The best option for most people will be to use Ting’s GSM network instead. For more information read our review of Ting’s GSM and CDMA networks. The LG Volt will not work, but a large number of excellent and affordable phones are compatible with Ting’s GSM network. 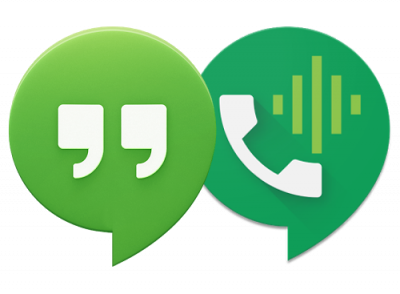 If you have had trouble activating a Boost or Sprint prepaid device you can let us know by voting here. 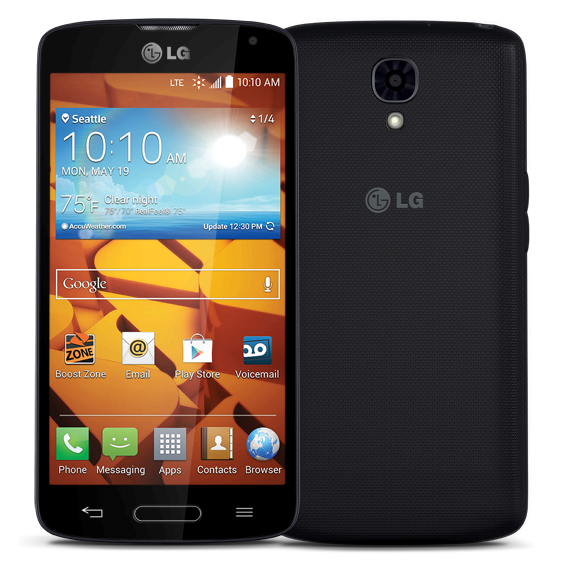 The LG Volt is available on Sprint prepaid, Boost, and Virgin Mobile for a retail price of $180. However, the actual cost has decreased significantly recently – at the time this article was published, the LG Volt was $60 on Amazon. 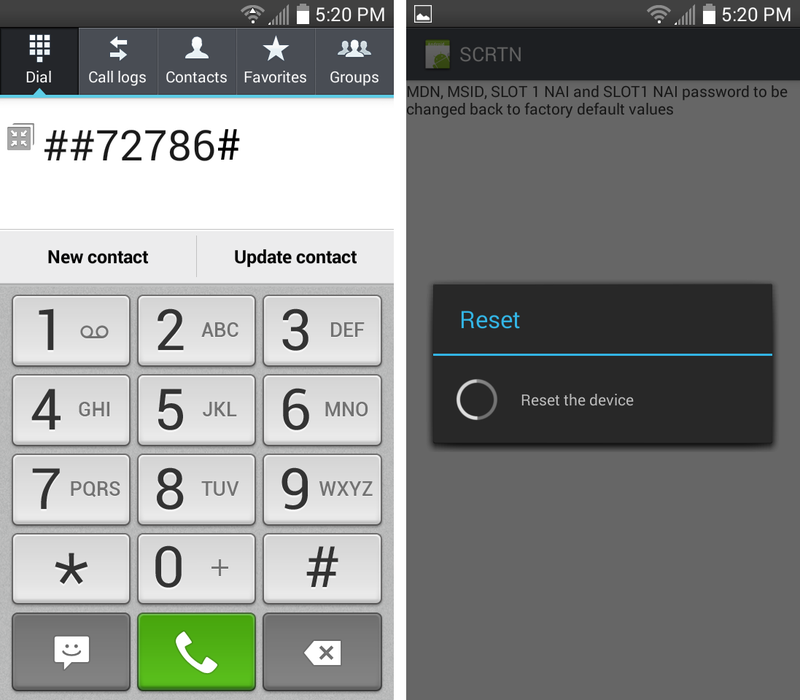 This post will show you how to activate the LG Volt on Ting. As explained in our previous posts on activating Boost or Sprint Prepaid phones, this device is not officially supported, but functions perfectly on Ting. To provide a brief overview, this is device is for people who want a lot of features and great battery life but do not want to pay a premium. A good phone for comparison is the Motorola Moto G as it costs about the same. The LG Volt is not as well made as the Moto G and has a lower resolution screen, but offers a lot of additional features such LTE data, storage expansion through a microSD card slot, NFC, an IR remote, and a high capacity battery. 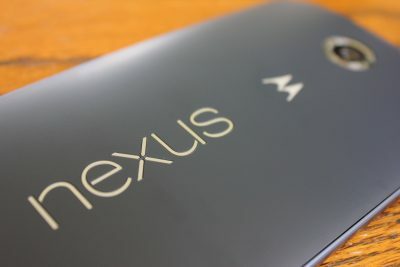 These are features not often seen in phones that cost less than $100. If you are interested in other inexpensive Boost Mobile devices that can be activated on Ting, see the Moto G and Sharp AQUOS Crystal activation guides. I was able to get the Boost Mobile version of the LG Volt to activate perfectly on Ting. Voice, texting (SMS and MMS), and data including tri-band LTE work as intended. However, there is no mobile hotspot feature and third-party tethering and hotspot apps do not appear to function. Much like the Moto G, tethering or a mobile hotspot is not possible with this phone on the stock software. Do you have concerns about activating the LG Volt or are currently having issues with it? Check out the FAQs section below for help. Buy a LG Volt. I have personally tested the Boost Mobile version but have heard that the Sprint prepaid version also works. Go to the Ting activation page and follow the prompts, entering the information they ask for. Restart the device and let it activate automatically. If the device does not immediately activate, open the phone dialer and press ##72786# to force a restart and the automatic activation sequence. 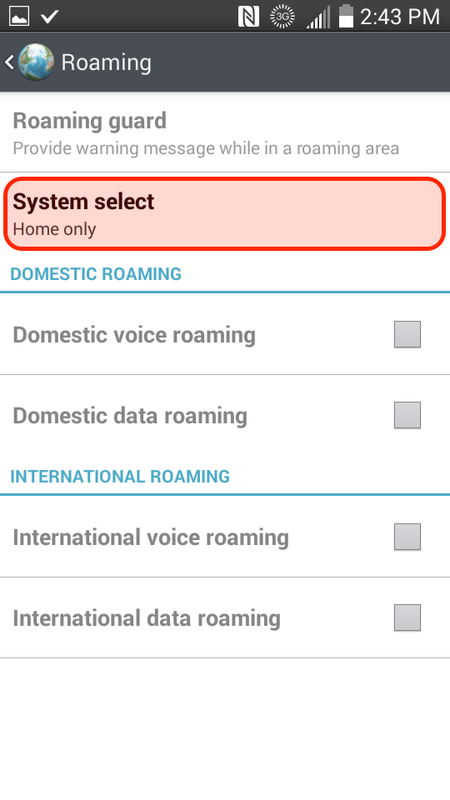 Change the network settings to allow domestic roaming. This phone activates no differently than any other Ting device. 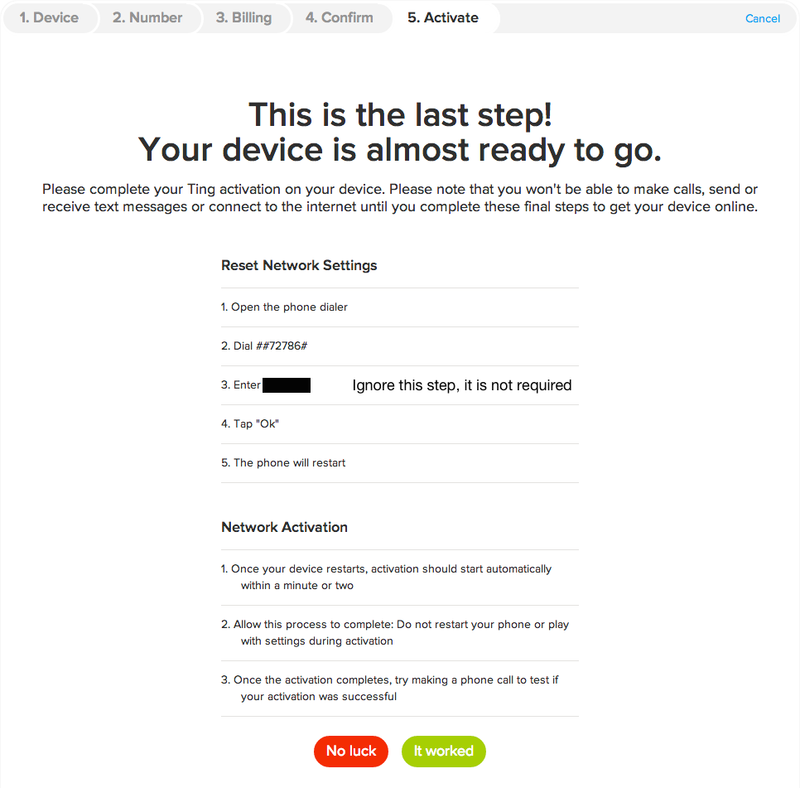 If you are familiar with activating a device on Ting simply follow the usual steps. For those who are new to Ting check out the detailed version below. If are becoming a new Ting customer you may use my referral link right before starting the activation guide to get a free $25 credit to your Ting account. If you use it, I will also receive a credit, so thank you! Buy a LG Volt. I purchased mine from Amazon, but you can also get it directly from Boost Mobile or from retailers like Best Buy, Target, RadioShack, and Walmart. Find the MEID number by checking the phone’s box, or on the device go to Settings → About phone → Status → scroll down for the MEID (DEC) number, and input that number into the BYOD page on Ting, and press the “Check” button.Pro tip: if you have another smartphone, the easiest way to get both the MEID and ICCID numbers is to scan the barcodes on the box using a barcode scanner app. < If the hands free activation does not start automatically, simply go to the phone dialer and enter ##72786# - you will see the reset pop-up window below. This will reset the carrier settings to default, restart the phone, and force the hands free activation to activate your device. To check that everything works properly, make a test call, send a regular text (SMS), a picture message (MMS), and browse a webpage with WiFi off to ensure data is functional. If anything does not work properly read the troubleshooting section below. If you found this tutorial helpful please share this guide or give it a +1 below. Thanks! Do I need a SIM card for this phone? The phone requires a UICC SIM that is included pre-installed in the device. Assuming you are buying a new LG Volt, the required SIM card will come pre-installed. 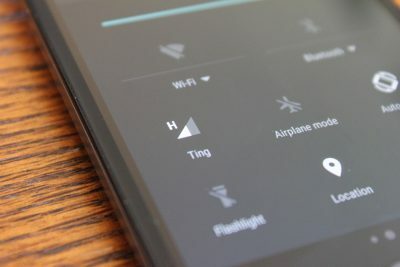 You do not need to buy a SIM card from Ting. Will only the Boost Mobile version work on Ting? What about the Sprint and Virgin Mobile variants? All I can say for certain is that I have personally tested the Boost version and it activates without any issues. I have heard that the Sprint prepaid version also works, but I have not personally tested that device. I am getting error messages like, “2513: Invalid recipient type” or “2511: Message too large” when trying to send MMS messages. What should I do? When you create a new line or port a number to Ting, MMS is turned off by default in your Ting dashboard. Those errors occur when you have not turned MMS on yet. To turn it on, go to your Ting device settings online, select your device, and click the pencil icon next to “Megabytes.” Now press the toggle to enable “Can send/receive pictures, videos, and group messages” and click save. I am having trouble with roaming, what should I do? 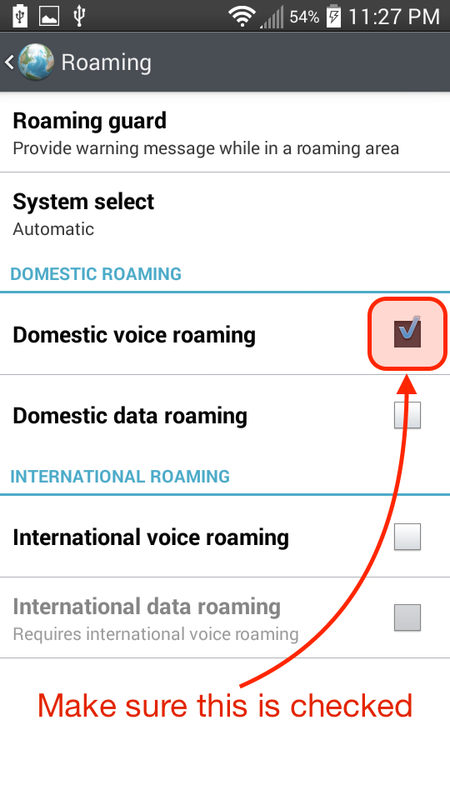 Make sure roaming is enabled by going to Settings → Roaming and change “System select” to automatic and make sure the box next to “Domestic voice roaming” is checked. 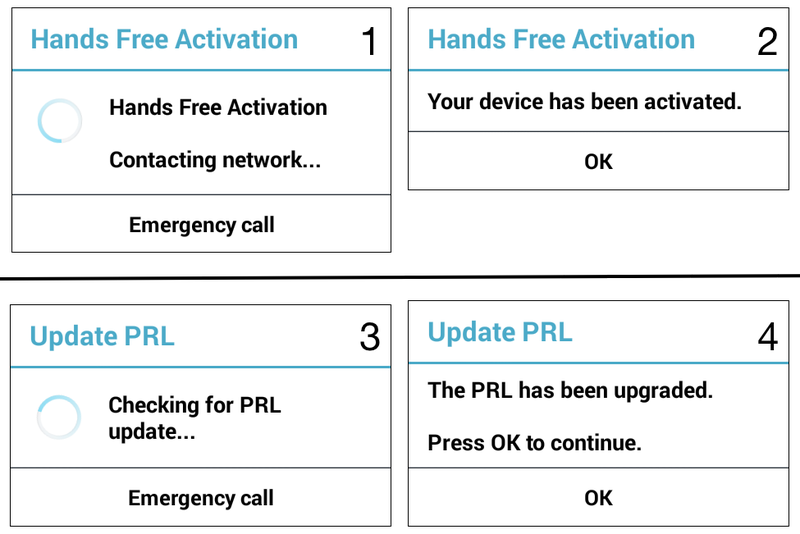 If roaming is enabled but is still not working you may need to update the PRL by going to Settings → System updates → and tap “Update PRL.” After any system software updates you will need to update the PRL again at that time. If you have any other questions or issues please tell us about them in the comments section below.